Several firms offer excursions to the Lipari Islands, also known as the Aeolian Islands, which include the volcanic island of Stromboli. There are seven of these magnificent Islands, each of which is steeped in history and culture. You will find beautiful scenery, volcanoes, castles, thermal resorts, water sports, fishing and of course some spectacular beaches, like you have never seen. Film makers have been using this magnificent scenery since the 1940’s. Evidence of the volcanic history of the Islands can be seen in the hot springs and mud baths on Vulcano just as in the colourful eruptions on Stramboli. Even now the volcano is still smoking quite happily and the flow of the lava goes directly into the sea like it has peacefully every 20 mins for the past 2000 years. A particular highlight of this cruise is watching this natural theatre at sunset from on board the boat. Just enjoy the fresh air or perhaps enjoy a romantic candlelit dinner on board. On land you can expect walks along the mountain slopes, crater excursions and a visit to the historical settlement. There are also night trips to Stromboli so that you can witness the breathtaking colorful eruptions and lava flows against the dark night sky. Trips to the Lipari Islands, including Stromboli are well publicised throughout the town of Tropea and the marina but two of the most popular companies offering trips are Comerci and Tropeamar. Ferry trips are the ideal way to capture the stunning views of both Sicily and Calabria and the crystal clear waters of the Tyrrehian Sea. Trips via ferry to Messina in Sicily from Reggio Calabria are relatively cheap and easy. Sicily is an amazing island not far from Calabria where you can visit ancient ruins, shop in the glamorous boutiques of Catania and indulge yourself in Sicily’s famous gelato (ice-cream) bars or eat traditional Sicilian cannoli. A day trip to Messina is an absolute must for those who are fascinated by ancient Rome, and Greek history. 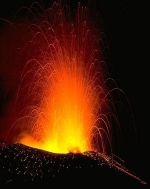 It is also the ideal opportunity to see Mount Etna, the world’s most active volcano. In summer months it is also possible to catch a train to Sicily from Tropea – the train actually goes on the ferry, an experience in it’s own right! There are numerous companies offering deep sea fishing trips. Blessed with thousands of kilometres of coastline, Calabria’s water sports facilities are second to none. 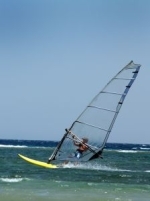 Windsurfing, Scuba diving, snorkelling, sailing and deep sea fishing are all very popular activities in the area. For diving fans, there are numerous specialist diving centres where you can learn to dive or for the more experienced, dive to one of the 50 sunken ships, some dating back to the 4th century. Or perhaps you prefer to cruise in Kayaks or canoes, or to float back to earth as you paraglide from high cliffs down to the crystal clear blue waters of the Mediterranean. The new marina facilities of Tropea includes all the water activities you may wish to take part in. Best of all for water activities is Shark Bay at the beach in Parghelia. They have all water activities including jet ski’s, canoes, pedal boats, speed boat hire and organised boat trips.. There are diving schools at the marina of Tropea such as the Torre Ruffa Diving Club. Calabria offers one of the best diving areas in the Italian Mediterranean. This is mainly due to the geological characteristics typical of the diving areas south of Tropea. These regions offer conditions that can be found hardly anywhere else in the Mediterranean. Many of the rocky reefs and the underwater peaks around Capo Vaticano hide such a variety of life that we are reminded of the Mediterranean’s nature of bygone times. The temperatures are very pleasant all year round, even in October. There is nothing more relaxing than getting a massage on the beach of Tropea or Parghelia. You can hear the waves lap against the shore whilst you relax and unwind. There are numerous masseuses that walk up and down the beach offering various massages at very reasonable prices. In Parghelia only a couple of minutes from Marasusa is Spa Le Mirage, a 300 metres enclosed oasis that provides a mix of well-being and relaxation. The qualified staff offer their expertise in suggesting the massage or treatment most appropriate to the needs of each and leave behind the usual routine. Further a field the Caronte Spa at Lamezia Terme is one of the most important thermal springs in the whole of Calabria. The precious sulphurous thermal mineral waters, springing from Mount Reventino, have been known since ancient times. The properties of the waters that spring out at 39.4°C, are various and are indicated for the cure of several pathologies, including those of the respiratory tracts, arthritic-rheumatic, gynaecological and dermatological problems. The plant of the thermal baths is modern, well-equipped and offers all the services you would expect of a modern spa. The closest golf course is the Feudo Montalto Golf Club in Limbadi, a small town 25km south of Tropea (30 minutes drive). The course lays among orange and olive trees. In spring (april-may), when you can play you will be surrounded by the smell of orange flowers, and autumn-winter, you can refresh yourself by picking an orange from the trees. Weather conditions in the region allow you to play every month of the year. Sample some of Italy’s finest home produce with visits to the local vineyards in Calabria. Here you will be briefed on various types of wine grapes, climates and soil. You will also learn the history of the wine including the wine making process, and of course sample some of the most beautiful wines in the world. Calabria devotes about sixty thousand acres to grapevines, it is no wonder this region is ranked highly in the world’s most famous wine regions. The locals are some of friendliest people you will meet anywhere, and will only be too happy to show you around their vineyards, and allow you sample some of their prize produce. Calabria is an area of outstanding national beauty and has not only beautiful beaches and beautiful mountains but national parks. One of these is the famous Sila national park which is North of Lamezia Terme and so high you can even ski in the winter! Another is the Aspromonte National Park which is located further south in the southern strip of Appennine mountains. This section of the mountain range is made up of cristaline granite and resembles a gigantic pyramid. The area is near the sea and reaches heights of 2000 meters with numerous mountain peaks and plateaus made up of marine sediment from thousands of years ago. The park territory, deeply marked by many rivers, is also home to numerous species, such as, the wolf, the pellegrine falcon and the royal owl. 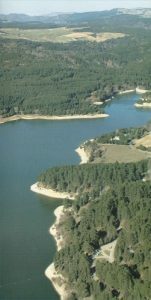 Covered by vast stretches of forest (beech, white firs, black pines and chestnuts), as well as, the typical Mediterranean vegetation. Surrounded by the Mediterranean sea, the park is host to numerous historical sites of artistic and archaeological interest, testaments to a deep seated culture: Greek, classic, medieval and modern. Aspromonte! A marvelous naturalistic and cultural experience for everyone. Again it is possible to Ski in the National Park at Gambarie. Its amazing but true that you can ski this far south in the high Appenine mountains of Calabria. There is an even more southerly ski resort which is probably the most southerly resort in mainland Europe at Gambarie in Aspromonte a small ski resort with just 4 ski lifts ( 2 chair lifts, 2 surface lifts) but it does boast a very impressive 670 metres (2198 feet) of vertical descent. 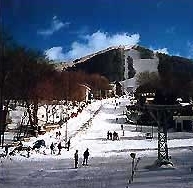 Gambarie in Aspromonte has 5 pistes. The Ski resort is just 100km away from Tropea and offers a very good Ski School. Check out the latest snow forecast. Calabria is a region of ancient Mediterranean culture and it is the place from which Italy derives its name. Italia, in fact, is a derivation of Italo, a king of Calabria. There are many archeological traces of ancient times, from prehistory to the settlements of the autochthonous Bruttians, to the great epic period of the Magna Graecia. Calabria can still give important visible testimony of these epochs, which were so fundamental for European history and culture. For example, the ruins of Sibari, the Roccelletta at Borgia, Locri and in its many museums. Calabria was therefore a ’bridge’ for different cultures, a land of transit, and for this reason exposed to assaults and invasions, to dominations and great popular uprisings for freedom. For the tourist, all this undoubtedly makes this journey through the history of man more fascinating. The Mediterranean Sea is a formidable barrier for broad-winged birds, which depend on thermals and updrafts for soaring. Consequently, most of raptors and storks are obliged to make use of land bridges, such as the main “bottleneck areas” of Gibraltar and Bosphorus. In spring a relatively strong migration of raptors is also noticed in the central Mediterranean, when fairly substantial numbers leave the African continent in the vicinity of Cap Bon in Tunisia and enter Europe via the Aeolian Islands and the Straits of Messina to Calabria, Italy. Species with a low wing loading are involved, such as Honey Buzzards, Black Kites, Marsh Harriers, Kestrels and Hobbies; the majority of these birds breed in central and northern Europe. Recently. Ornithologists counted 3100 migrating raptors in this area during the months of April and May. The birdlife in Calabria also includes the black woodpecker, Bonelli’s eagle, goshawk, peregrine falcon, the eagle owl, sandpipers, redshank, the collared pratincole and other waders as well as duck.